Thor has his classic duds on. There's Hawkeyes and Wasps. Heck, there's even a Ghost Rider, Daredevil, Quasar and what appears to be a Black Panther! While the X-Men and fellow non-Marvel movie team The Fantastic Four are notably absent, the above free-for-all teaser by the amazing Alex Ross is the first of many teased "major announcements" for the Marvel publishing line. Written by Jonathan Hickman and with interior art by Esad Ribic, the year long event leans towards a reboot much of the cluttered Marvel landscape in a DC 'Crisis' style, timed to launch around the release of next year's eagerly awaited blockbuster Avengers : Age of Ultron. Will a year long event, the name, and tie-in merchandise be the only links between this Secret Wars and it's landmark 80's predecessor? Or will we see a new Beyonder, promises of power and universes at stake. At least one out of three is certain. Yeah. I'd be cynical about it, except that splash page has me so hyped and squealy I'll beg them to take my money. Thanks Random - I hope both series do well, but also put a halt to the #1sing of late. It's just gotten crazy. For my money Marvel NOW! but the New 52 in term sof reviving a line. Now they are actually looking at going directly head to head with a revamp of their biggest 80's crossover hit, fandom will really be able to draw a more direct comparison like you say. 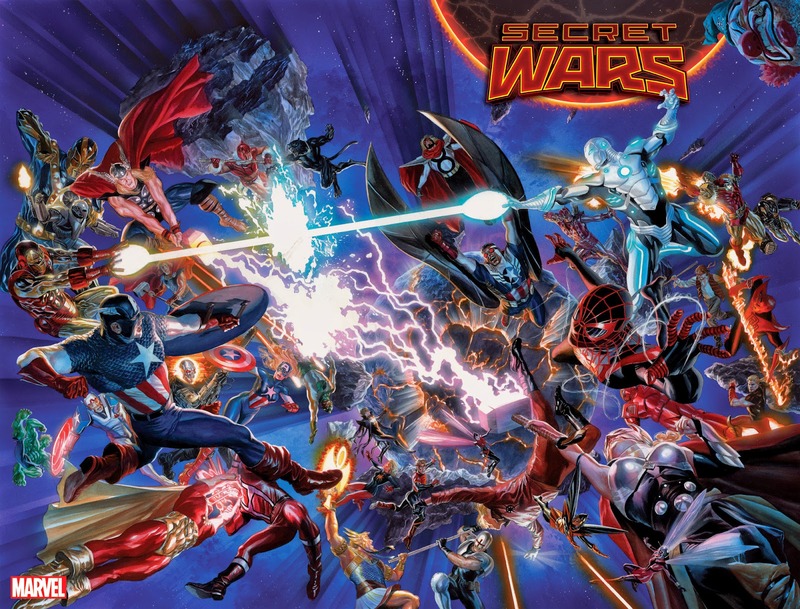 I don't know about DC fans, but just reading the words "Secret Wars" sends shivers up my spine. It's still my benchmark for a lot of characters. Like Absorbing Man reattaching is arm when he turns back to flesh. Tiny part of the whole, but it sticks in the brain. Man, that would have been great for Agents of H.A.T.E.